Providing you the best range of clinker grinding plant and rotary kilns with effective & timely delivery. We are well-known Clinker Grinding Plant manufacturer, exporters and suppliers of an array of industrial products. 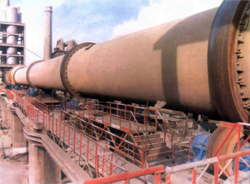 We offer our clients with the variety of Clinker Grinding Plant, cement plant machinery etc. Our products are made using fine quality raw material and state-of-the-art technology. At all levels of production the quality is maintained and vouched for by our team of professionals. These Clinker Grinding Plant are made as per the needs and requirements of the clients. Furthermore, these are available to our clients at market leading prices. We are engaged in manufacturing & supplying Rotary Kilns, which is made of optimum quality raw materials. These rotary kiln equipment are used to raise materials to a high temperature in a continuous process. Looking for Rotary Kiln ?